The Bruce Highway is a major road between Brisbane and Cairns. 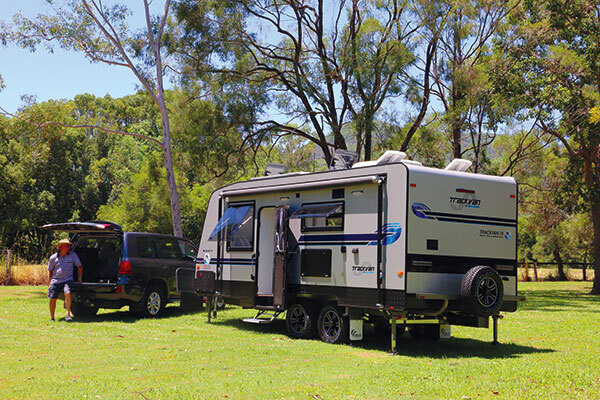 Recently, the stretch between Brisbane and the Sunshine Coast has become a magnet for those seeking an RV. One area where dealers concentrate is Chevallum. 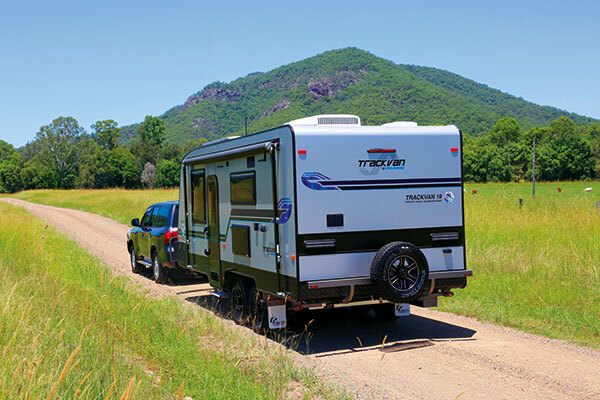 Here, Caravan World Sunshine Coast was the trendsetter, with owner Brad Pendleton seeing the benefit of a large sales area and highway frontage. 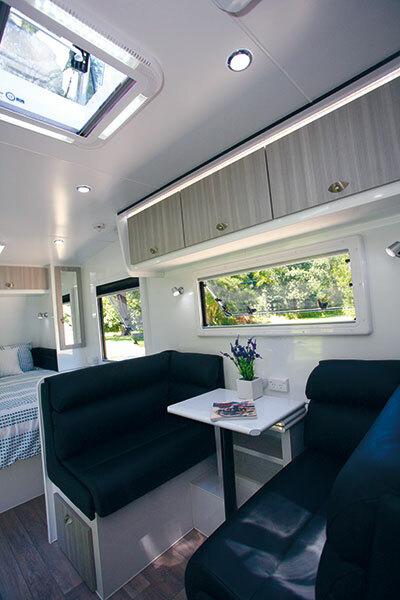 This foresight allows Caravan World Sunshine Coast to accommodate newcomers like Eden Caravans, and recently, proprietor Pendleton was keen to show me a new Eden Trackvan 19. A tandem-axle van suited to “semi offroad use”, that is, national park-type roads and tracks that usually don’t need 4WD. 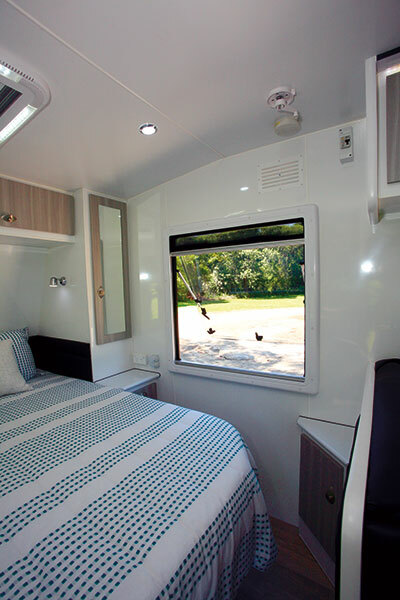 Although the Trackvan has a very unassuming yet easy-to-clean grey colour scheme, it uses a trendy black and white palette inside, which in this case was blended with a few grey tones, mostly on the cupboard and overhead lockers. It looks a little stark but I do like the white finish – it makes for a bright interior, something handy in a confined space. It’s also very easy to get a decent photo, too! 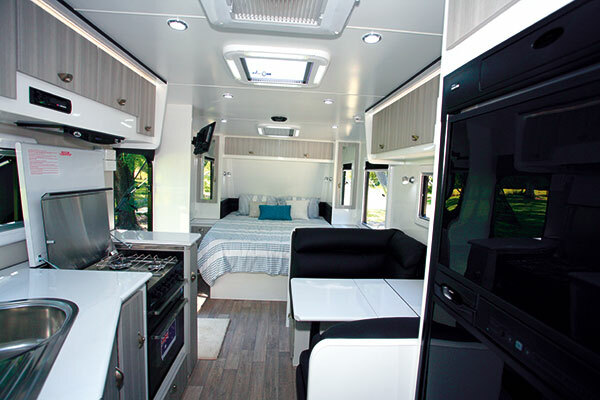 In a van of 6.02m (19ft 9in) long, the forward habitation door makes the most of the interior space. Consequently, the front island bed/rear bathroom layout isn’t really compromised in any way and the living areas – bedroom, kitchen, dinette and bathroom – are nicely sized. Up front, the bedroom area looks simplified but that is mainly due to the colour scheme because it has all the necessities – 1.85m x 1.52m (6ft 1in x 5ft) island bed, side wardrobes, bedside cabinets and overhead lockers. Mirrors on the wardrobe doors complete the ensemble and each side of the bed has both 240V and 12V/5V USB power sockets. About the only problem here for those like me who charge all their tech gadgets overnight is fitting everything on the shelf! Large windows on either side and a mid-sized roof hatch give a good level of ventilation. Even with the small diagonal cupboard fitted to the offside corner, bed walk around space is still quite good. Some dinettes look just like seats while others are positively inviting. This one definitely fits in the latter category with the wall cushions creating a mood for sitting back and putting the feet up. More practically for dining there is a multi-fold table, which will accommodate two comfortably but not four, given the wheel arch and shelf area underneath. Above the table on the wall is a set of 240V/12V/5V USB power outlets, which is a much better position than under the seat as the table offers space for charging devices. For using the under seat storage area, a drawer is fitted to the forward seat and a floor locker on the rear seat. Above the dinette are three overhead lockers. To maximise the kitchen bench area, the designers have used the old trick of angling the bench at the bathroom end where the sink/drainer is located. This results in a bit more benchtop area and cupboard/drawer space underneath but a longer stretch to reach the microwave above. Alongside the sink, the four-burner cooker/grill/oven has a hinged flush lid, so when it's not used, there is actually a fair bit of benchtop area. Using cupboard space is sometimes a challenge and I sometimes think an extra detachable shelf would be a nice idea. 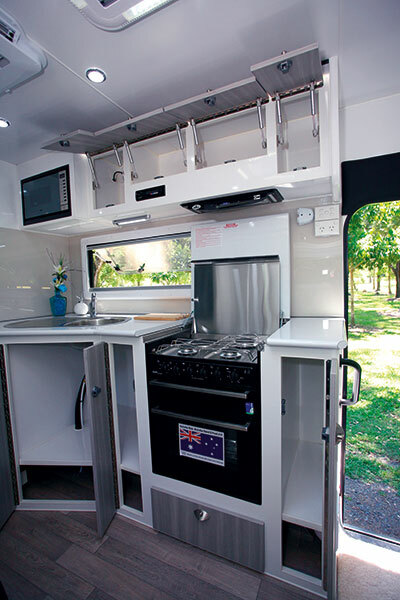 Like the bed and the dinette, the kitchen bench also comes with 240V/12V/5V USB outlets – no problems with charging anything in this van! 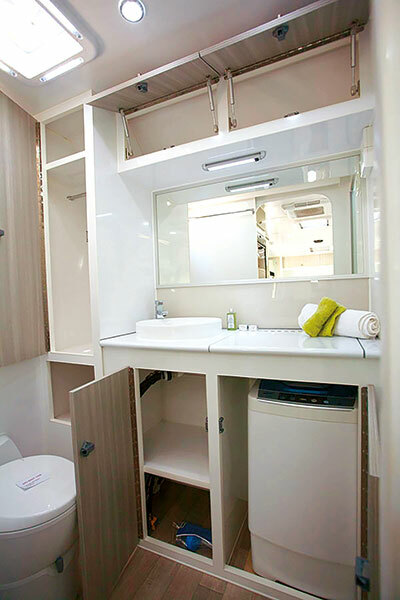 The rear bathroom has all the expected features – shower cubicle, cassette toilet and vanity cabinet, washing machine. Whilst it is easy to turn in the shower, the toilet has limited elbow room. Copious cupboard and locker space, good-sized wall mirror and contemporary washbasin all mean the vanity cabinet functions neatly together. Structurally speaking, the Eden Trackvan is conventionally built with a galvanised box section chassis that has 150x50mm (6in x 4in) RHS members for the A-frame and 100x50mm (4in x 2in) RHS for the chassis rails, and 75x50mm (3in x 2in) raisers. A look under the van reveals the freshwater tanks are fitted forward of the wheels and the grey water tank behind. On the subject of wheels, the van rides on AL-KO 3.3T independent suspension with coil springs and trailing arms. Future models will have two shock absorbers fitted to each wheel, not just one as with this van. 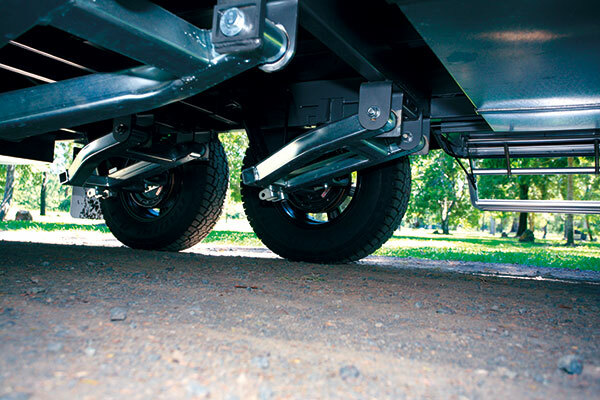 At the pointy end, a Cruisemaster (formally Vehicle Components) DO35 offroad hitch is fitted. Aluminium is the material of choice for the body structure – both the interlocked frame and the composite body panels. External bin space is provided by both a front tunnel storage and a toolbox mounted on the drawbar. With a Tare mass of 2440kg and an ATM of 2940kg, the Trackvan scores quite well in the weight department, having a payload of 500kg. 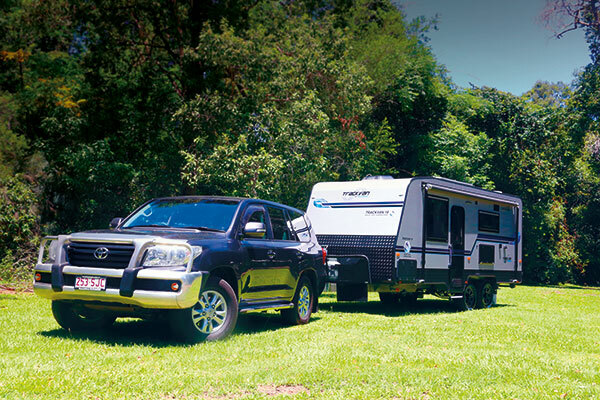 It fits into the Ford Ranger/Isuzu D-Max towing capacity quite well, with room to spare. However, my tow vehicle was the venerable Toyota LandCruiser and there’s no doubt about the relaxing benefits of a tow vehicle combination that just cruises along! Eden Caravans might be a bit of a new name but it’s clear the builders have had plenty of experience in the caravan building business. In the weight department, the van scores quite well, yet there is still a good load capacity and plenty of comfort room to move around inside.